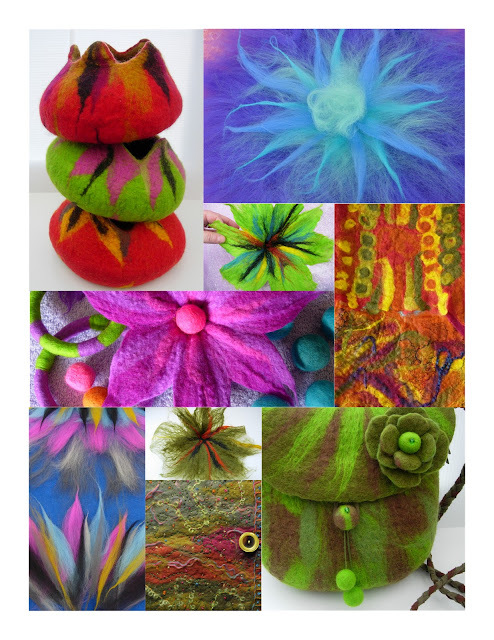 "INTRODUCTION TO FELT MAKING" : Saturday 7th. May. Simple felt making techniques will be explained, with everyone making one or more pieces of flat felt, experimenting with blending colours & textures. Plenty of ideas & examples of interesting end projects will be on display. "FELT JEWELLERY" : Saturday 14th. May. This workshop is now fully booked. Creating felt flower brooches, beads & bangles using a variety of simple felting techniques, with lots of ideas for decoration using needle felting, beads & embroidery. "DESIGN & FELT A BAG" : Saturday 21st. May. 2 places are now available due to cancellations. First design & create a shape for your bag, then felt a unique seamless bag in one piece, with ideas for handles, fastenings & toggles. "SOFT POTS & BOWLS" : Saturday 28th. May. This workshop is now fully booked. Felting 3-D shapes using a flat 'resist' and 3-D moulds, creating vessels & bowls, with ideas for incorporating handles and decoration. "FELT SLIPPERS" Saturday 4th. June & Saturday 11th. June. The workshop on the 11th June is fully booked, there's one place left on the 4th June. Making a pair of wonderful felt slippers, with instructions on sizing, making and decorating the slippers, and tips on attaching leather soles. techniques, so to save time on the day, I advise that you will have previously taken part in my Beginners Workshop before you move onto the more advanced classes. All the workshops run from 10.30am - 4.00pm and will be held as before in the West Wight Landscape Partnership conservatory at Maderia House, Avenue Road, Freshwater, PO40 9UU. All materials and equipment will be supplied and included in the cost of the day. This will be £25 for all the workshops, except "Felt Slippers" which will be £28 to allow for the extra fibres needed to complete the project. Numbers will be limited to 8 people. You will just need to bring a packed lunch (tea & coffee is available) plus an apron, extra towel and rubber gloves (if needed).